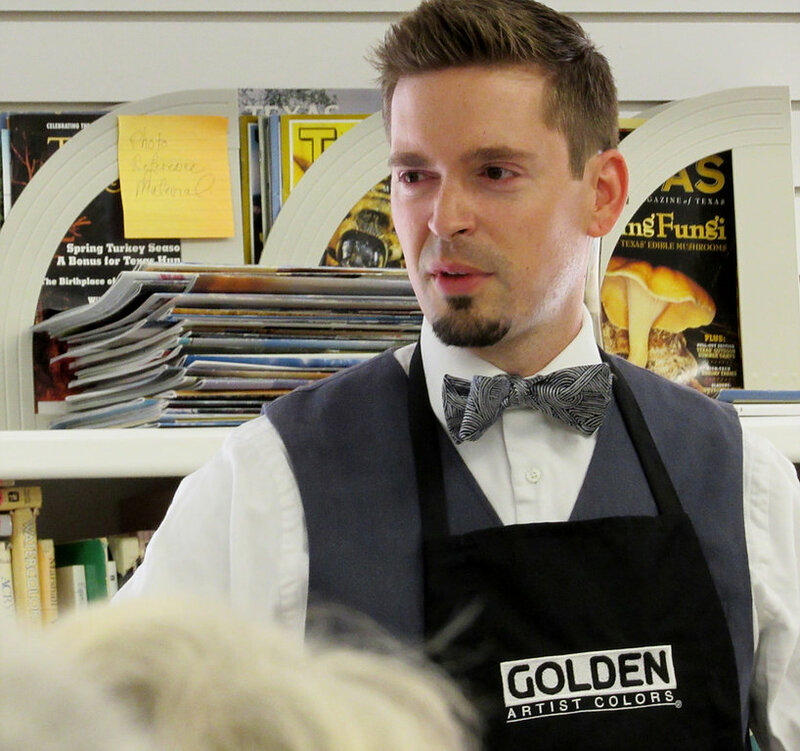 Justin will present a GOLDEN Acrylics lecture and demonstration, a fun informative, educational and fast-paced introduction to all the products GOLDEN has to offer. The lecture covers information about the different types of acrylic paints, mediums, gels, pastes, and grounds. The lecture will also cover a technical review of acrylics and their varied application possibilities, working with mixed media, printmaking, and the review of GOLDEN’s newest products including OPEN acrylics, High Flow acrylics and QoR watercolor. This lecture will hopefully give you some new insights that can be added to your creative process. All participants will receive a free information packet, hand-painted color charts and a bag of free GOLDEN product samples to take home. Supplies are limited, so RSVP at info@irvingart.org or smurray4@msn.com BY OCT. 17 to reserve your free samples. Justin will also be presenting workshops using Golden products for us next January and February. Details TBA. Justin grew up in Farmers Branch, Texas and studied close to home at the University of North Texas. He earned his BFA focusing primarily on Studio Drawing and Painting in 2013. Before achieving a BFA, Justin and his twin brother were traveling playing music and signed a record contract to Island/Def-Jam Records in 2009. During his travels playing music, Justin experimented in painting and photography and began to gather photographs of a small community were the Burns family has a one-hundred-year-old farm in Kopperl, Texas. Justin took interested in stories of the farm, community and what is physically left behind. After experiencing an apartment fire where he and his family lost everything in 2014, Justin’s work began to take a new role and meaning. His work focuses on spaces that are left as they are, weathered and abandoned fragments of a time once lived. His paintings have been exhibited in Dallas/Fort Worth and have been featured in publications such as Studio Visit Magazine and Friend of the Artist. His work was included in the prestigious New Texas Talent Exhibition this August. For more about Justin, see his website http://www.justinlburns.net.